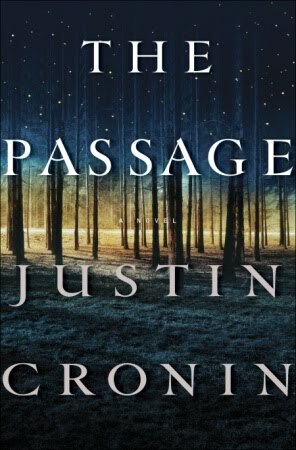 I feel like I've just woken up from a crazy dream after reading The Passage by Justin Cronin or more appropriately recovered from a virus. Because this book is like a virus, it will get under your skin and won't let you go until you finish it. I started this nearly 800 page tome on Friday night and finished it Tuesday. I couldn't stop reading it or thinking about it. The book starts just a few years into the future. The US is still at war and things just get worse and worse. The Army decides to use a virus they discovered in the rainforest to biologically weaponize 12 death row inmates. These guys have turned into unimaginable creatures with vampire-like qualities. The scientist in charge wants one more subject: a child. FBI Agent Wolgast is charged with the terrible task of bringing an abandoned 6 year old named Amy to the lab. Of course things go awry, as they always do, the 12 inmates escape and the world turns into a blood bath. They spread chaos and death and infect 10% of the human population with the virus. Meanwhile, Wolgast disappears into the wilderness with Amy who is strangely changed but not in the way the others are. It's nearly 100 years in the future. There are very few survivors and they are holed up in a Fema camp called The Colony surrounded by lights that must be turned on every night. If there are no lights, people die horrific deaths at the hands of the "flyers" or "smokes" as the people infected with the virus are called. But time is running out for them. A small group of the survivors know something must be done to save the rest but no one knows what to do until Amy appears. She's walked the world alone all this time. This isn't a spoiler. The first page of the book tells us she's lived 1000 years. They decide to take Amy with them on a journey to find out the meaning of her impossible existence. A child but not a child who has survived in the dark on her own since the Time Before. I know what you're thinking. Just another virus destroys the world story. Yawn! And honestly when I started reading it I thought so too. "Why all the fuss?" It wasn't until about 50 pages in that I got hooked and that was it for me. It is different! There is an underlying mysticism to the story. It is an Epic, like the old Viking stories. The characters in the book will go on a perilous journey, see strange things and perform heroic acts. And you will love them and they will break your heart! Cronin creates this world that seems entirely possible. The people he chooses to tell the story feel like real people with their own stories of suffering. Sometimes I wondered why he was telling us all this detail. I just wanted him to get on with it but there is a method to the madness. Patience will pay off. They felt so real to me that when I had to go for groceries, I wandered around in a daze thinking about what would happen to them next. Yes, that's the kind of book this is. They aren't just survivors; they are people who want to live. Reading The Passage was an emotional experience. There is so much suffering but there is also so much of what makes the best of humanity: love, friendship, loyalty and sacrifice. Although so much is answered by the end, I still said, "Well.....then what happens." I want more! 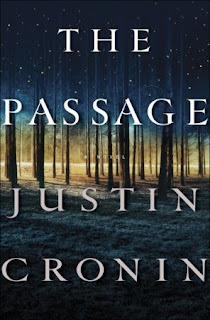 So, The Passage isn't in stores until June 8th but get ready for it now. Put it on your shopping list or get in the library queue now. Yes, there is hype around this book but it totally deserves it. It is the best book I read this year. Just be prepared to be kidnapped by this book until the last page. Thanks Random House people for sending me the review copy. I have a copy, but can't get to it until sometime after BEA. I'm getting twitchy waiting. Wow, wow, and WOW. This book sounds amazing, and I have to have it. It's already on my wish list. Thanks for that great review...I am excited to read it! I have a feeling this book is going to be huge! I really, really liked this book as well. Great review. Jen- I can see why you're twitchy! Connie- I hope you get it. Kathy- I think so too! Swapna- Glad you liked it. I got a copy of this at the Texas Library Association conference a few weeks ago. I attended a sneak preview session and the publisher rep said to grab one because we would wish we had if we didn't! Sounds like she was right! Can't wait to get to this one. Think it may skip to the top of my pile. I feel very jealous right now : I want to read it, and I want to read it now! I think I'll buy it as soon as it hits the stores; I love perilous adventures in an epic style. Great review! Agreed! It's the whole epic thing that I absolutely loved. I'm so glad you loved it too! My only problem with the book is that the next two won't come out for quite a while (2012 and 2014 I think), but I can't imagine that writing a 750 page book (which I imagine was edited *down*) is something that you can write quickly. Trish- Ga! I can't wait that long! I wish I heeded your warning! What I wouldn't do to get my hands on this book right now! I got super lucky and obtained a signed copy of this at BEA, I'm scared though, because my expectations for this book are super high! This has been on my to-read list for a while and I just may have to bump it up. You've made it sound so thrilling!